On the second day of Chanukah, thirteen JUF TOV volunteers boarded a plane for New York on a Hurricane Sandy Relief Mission to help those affected by the severe flooding that decimated parts of New York and New Jersey in late October. The floods forced thousands of New York and New Jersey residents from their homes and major swaths of the states are disaster areas. The three-day community mission to New York was sponsored by JUF's TOV Volunteer Network in partnership with NECHAMA: Jewish Response to Disaster. NECHAMA—which means "comfort" in Hebrew—is the only Jewish disaster response organization in the United States and has been on the ground since the hurricane struck the region. "Disasters are very heavily faith based," said Gene Borochoff, President of the NECHAMA board and one of the organization founders. "We feel that there is a need to represent the Jewish community and the Jewish community needs to be involved and represented in the disaster response." "This is great being able to work in a synagogue [today]," Borochoff continued, "but for the most part we spend the majority of our time in places that don't have a Jewish population…trying to help those with [the] greatest need. Coming in with your own hands and heart, that is a major difference." 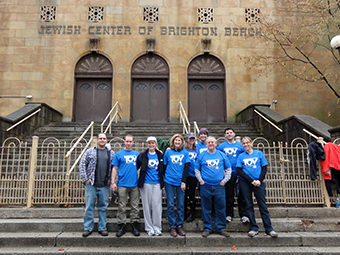 The TOV volunteers were sent to The Jewish Center Brighton Beach, which was devastated by the storm. Built in 1928, the historic landmark is one of the oldest synagogues in New York. The congregants are currently using a local department store as a house of worship. Dressed in old clothing, facemasks, eye goggles, and work gloves, the volunteers gutted the synagogue removing toxic debris and mold all the way down to the frame to prep the center for reconstruction. 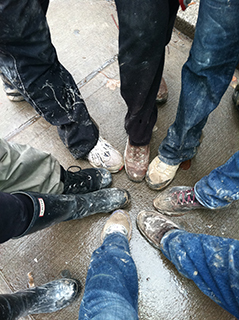 "We are pulling away all the debris…," said Judy Springgate, a TOV volunteer. "There's drywall, doors, insulation, wood, exit signs and pipes and we took all [the materials] out with our bare hands and really helped this community." While there, the TOV volunteers celebrated Chanukah with local rabbis at a synagogue that had been repaired and rebuilt by NECHAMA and finished the week prior. "It was a particularly meaningful time to bring a group of volunteers over Chanukah," said Yael Brunwasser, director of the JUF TOV Volunteer Network, "a time of year when spreading light and rebuilding are essential themes. Over the course of three days, volunteers worked to repair a destroyed synagogue, truly embodying the spirit of tikkun olam." "It is so unbelievable the group of people who've come together from different ages, different groupings, and different backgrounds, even from different states," said Wendi Passen, a JUF Women's Board member and a mission participant. "It was so cool to team up with NECHAMA. The fact that we are doing this for three days and they are doing this for two years or four years and fifty days in a row…this is an experience I will never forget." There are still over 200,000 homes and centers in New York that were declared inhabitable that require repair. "How bad the damage is, is unreal," said Erin Gordon, another TOV participant. "You don't really see or hear about this on the news anymore as much as you did in the beginning and it's just sad and scary how bad things really are." 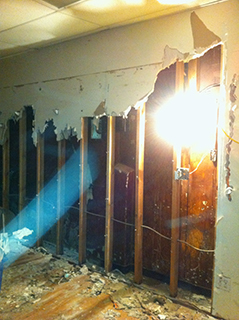 A second Hurricane Sandy Relief Mission comprised of Chicagoland Hillel students leaves Sunday, Dec. 16 to continue the long and arduous process of readying the Jewish Center Brighton Beach for reconstruction. As of Nov. 19, Jewish Federation's Hurricane Sandy Relief Fund had raised almost a half a million dollars for relief efforts. 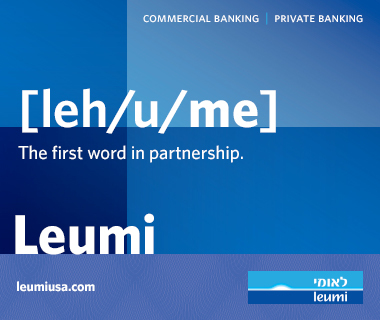 "I'm delighted to be part of this amazing effort coordinated by JUF and TOV, said Adam Hyman. "I'm going to tell everybody about the organization NECHAMA and the important work that they do. I feel fortunate to be a part of it." 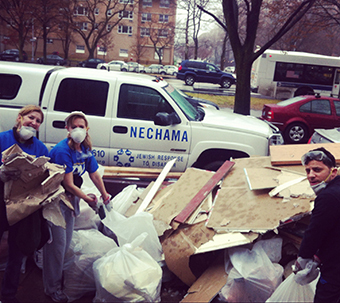 Click here for more information about NECHAMA— Jewish Response to Disaster. The Jewish Federation of Metropolitan Chicago is accepting donations to help those impacted by Hurricane Sandy and the following snowstorm along the Eastern seaboard. Chicagoans may contribute online at www.juf.org/relief, by calling (312) 444-2869, or by sending checks to: Jewish Federation Hurricane Sandy Relief Fund, Room 3022, 30 S. Wells St., Chicago, IL 60606. The Chicago Federation will absorb all administrative costs, ensuring that 100 percent of all donations go directly to aid those most affected- -both the Jewish and general communities and to first responders along the East Coast- through the Jewish Federations of North America (JFNA) and other relief organizations and social welfare agencies.